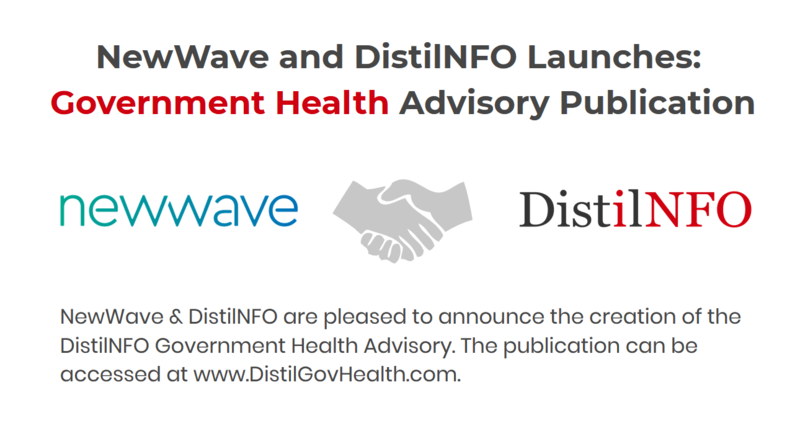 NewWave is pleased to announce our partnership with DistilNFO and the creation of the DistilNFO Government Health Advisory, an exciting new publication. The publication can be accessed at www.DistilGovHealth.com. The role of federal, state and local government in healthcare is changing fast, accelerated by the adoption of disruptive technology and innovation. The goal of the DistilNFO Government Health publication is to keep executives who are focused on the intersection of healthcare and government up to date on new technologies, innovative companies, the context of change and building a strong Government Health Community in this time of rapid transformation. Tony Trenkle, the former CIO of CMS says, “Patrick Munis-CEO of NewWave, Susheel Ladwa-CEO of DistilNFO, and myself, are all leaders in the health IT space and have developed and implemented numerous health systems, both large-scale and human-scale. We bring a unique perspective to the issues and challenges that [executives] face every day. We will use a singular combination of algorithm-based, human subject matter experts and thought-leader curation to provide a uniquely valuable source of information. The online publication will also have an eNewsletter with topic-based insights. Our initial topics are meant to be provocations to thinking differently, reconceptualizing and innovating in the combined space of technology, governing and healthcare: Emerging Technologies, Tools & Thoughts, Federal Government Technics, State, Local (and Global)IT, Policy and Operations, Innovation in Action. “Innovation and modernization are in the DNA of NewWave. This DistilNFO Government Health publication will help bring conversations on new technologies, innovative partners and Industry thought leader viewpoints at a central place. NewWave is glad to partner with DisitlNFO, a leader in Healthcare publications to launch this initiative,” says Patrick Munis, NewWave’s CEO. NewWave Telecom and Technologies, Inc. (NewWave) is a full-service Information Technology (IT) and Business Services company applying the power of technology to help businesses thrive and better serve humanity. The NewWave Team merge innovation, precision and compassion, empowering their clients to use technology in new ways as they solve problems for the greater good. DistilNFO is a media company with over eight publications across Healthcare, Retail and IT Industries. DistilNFO’s focus is to create right content at the right time for the right audience. DistilNFO publications reach a majority of the executive decision makers in the Healthcare, Retail and IT Industries. Visit us at http://www.distilnfo.com/ for more information.